Don't you love the title of this book? I decided to name my home The Dwelling of Dreaming Books. 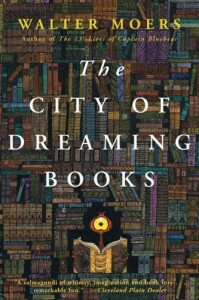 Although it is obviously not a whole City, it also has hundreds of books "sleeping/dreaming" away on shelves and in stacks and piles all around waiting to be woken up by someone picking them up or pulling them down off the shelf and opening them to read. I enjoyed this book enough to keep plugging away to the end, but the author could have used a good editor. He tended to get very long-winded in certain passages. I think he may have even realized that as the "translator's note" (it is written as if translated from the original Zambonian Language"), pleads that the original book was several thousand pages longer than what was included here but if he had included it all, the reader would be reading for a very long long time. I myself wondered if I would ever finish. Not sure that I will be rushing to pick up another Zambonia book in the series, but I might. The need to learn more about this wonderful place, might override my caution, I will just be prepared to dig in for a long haul.